Great for party bags or kingyo sukui! Now you too can enjoy Kingyo sukui, or goldfish scooping, a favorite activity at festivals across Japan. 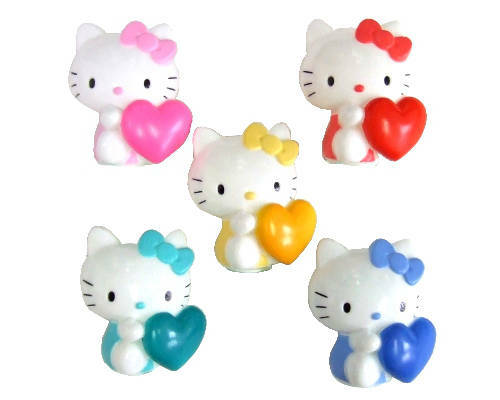 Scoop up a miniature Hello Kitty figure with the scoop and it's yours! Or they make ideal additions to your little girl's party bag. These miniature Hello Kitty figures make an ideal addition to your little girl's party bag. Or add them to your Kingyo Sukui, or goldfish scooping, a favorite activity at festivals across Japan. Scoop up a Hello Kitty with the scoop and it's yours! Trickier than it looks, the scoops have thin sheets of paper that easily break. You can choose different thicknesses of paper to make the more more challenging, or easier for younger kids. We also sell packs of lifelike rubber fish, disposable or reusable scoops, rubber "superballs" and other items for this popular game.